My copy of DBR arrived via UPS yesterday and I read it cover to cover on the subway between meetings and at home before dozing off. It’s easy to inhale. I’m pretty upbeat about it for two reasons. One, it’s a great example of getting ideas to market quickly without upfront printing costs (the book is printed on demand via Lulu). Two, I think it’s the right format to spark a conversation. The content of the first issues left me wanting more. More detail certainly. 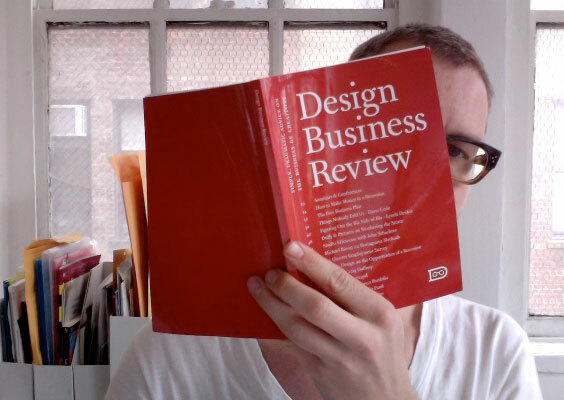 DBR doesn’t offer the depth of classics like Talent is Not Enough: Business Secrets for Designers by Shell Perkins. Some of the chapters ramble and don’t go beyond the platitudes that come up in lunchtime conversation. But that’s about all the complaining I’m going to do. The format is perfect. Publisher Chris Papasadero calls it a ‘public beta’. The phrase, borrowed from software development, is an indication how much our offline world is being influenced by the digital. Public beta also sets the right expectations. DBR was put together with a focus on getting it done and out there with the explicit call for interaction and feedback. We can expect the publication to evolve from issue to issue and improve both in form and content as it gains traction. The choice to print it rather than create a blog is great. It can be carried around, shared and complained about. It will certainly get widely distributed and talked about online, closing the feedback loop of how the discourse can take place today. I have not read it, I have not seen it, but I must say the cover look authoritative, Especially with you peeping from the back of it! So hopefully it can deliver in the future.